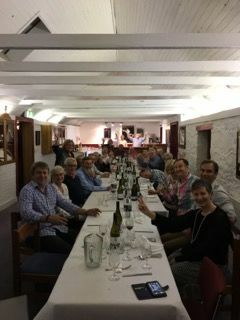 MCCRTS sent a strong team down to Hobart on 24th/25th March 2017, the team consisting of Robyn Woods, Robin McAllen, Martin Fuggle, Greg Reid, Greg Henderson, Stuart and Annie Strange, Vince Scopelliti, Ruby Crysell, Tim Raw and Wendy Whitehead. MCCRTS have only won this event once, however, the team started strongly finishing the first day 8 sets to 3 ahead. A wonderful dinner was provided on the Saturday evening upstairs in the club rooms. Thank you to Biz and Ian Ritchard for cooking up a much appreciated 4 course dinner for MCCRTS players and their partners. It has been tradition that MCCRTS starts the Sunday tennis slowly after a late evening the night before, and Hobart having the luxury of fresh players to draw upon. However this year, MCCRTS players showed strong performances again on the Sunday, especially the dynamic duo of Greg Reid and Greg Henderson who won both of their doubles matches convincingly, 8/1 and 8/0. The weekend was professionally coordinated by Brett McFarlane, many thanks to him. The overall score for the weekend saw MCCRT winning 14 sets to 7. We look forward to hosting HTC when they travel to Victoria later in the year for another challenge.